RNIB College Loughborough has achieved top national accreditation for its work experience placement scheme. The college, which offers Further Education and Social Care provision for students with disabilities, aged 16-25, was awarded the gold level Work Experience Quality Standard for its comprehensive work experience programme.. The accolade comes from Fair Train, a national body which champions the benefits of quality work experience for all. Students have access to a database of over 100 employment opportunities, helping ensure everyone can find a placement relevant to their skills and interests.This year the college has had 65 students attending work experience placements with 56 different employers. 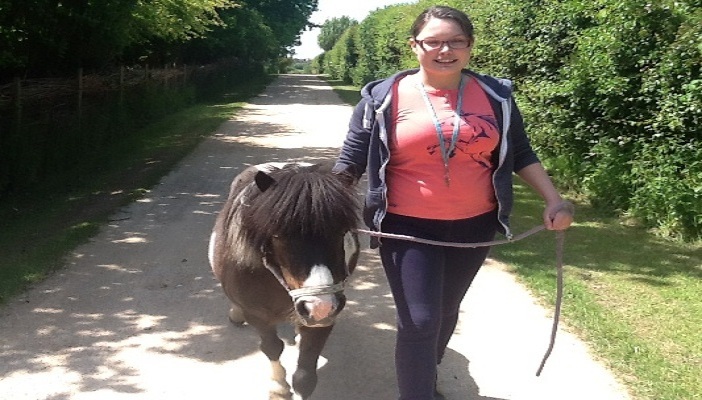 One of the students, Amy (pictured in the photo), attended a placement on a farm. She was able to follow a work routine which included farm work like mucking out, bringing in the animals and also conducting tours. Amy developed positive work relationships with other volunteers and colleagues and found that her confidence and levels of independence increased. To find out more visit RNIB College Loughborough, where you can also find details of the upcoming Family Open Day on Saturday 3 October.